Did you know that you can add 2-4 years to your pet's life with proper dental care? Dental hygiene is an important part of of your pet's health and can often be the cause of serious illness. If left untreated, dental problems can lead to larger systemic issues in your pet due to oral bacteria entering the bloodstream and damaging the kidney, heart and liver. It is estimated that more than 80% of dogs and 70% of cats over the age of three have dental disease. 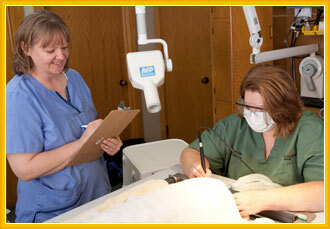 Your pet's annual check up and dental cleaning is the best way to promote healthy teeth and gums. Every dental cleaning involves scaling and polishing the teeth both above and below the gumline and full mouth digital x-rays to help detect tooth and bone loss.